Insects, microbes and pests scamper about stealthily in the attic and crawl spaces, unknown to the residents of the house. These harmful living creatures make a home in your neglected attic and crawl spaces and keep feeding on the wiring, insulation, ducts and treasured belongings because they have no fear of any “resident-outsider”, entering their space. The pests and small animals end up causing expensive damages because of their insatiable appetites and only a keen professional microscopic eye can dig them out of their hiding place. We can help you here! Call us at Quartz Solutions to avail our free inspection package which includes scrutinising each hidden corner of the attic and crawl spaces. Untouched and neglected Attic and crawl spaces become the breeding ground for pests, microbes and other unwanted intrusions that are potentially hazardous for your home and family. Get them removed, now! 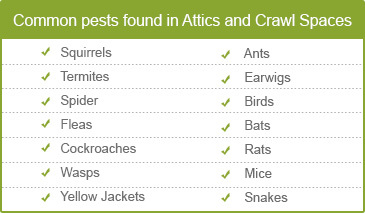 Roof rats, mice, bats, squirrels and raccoons hide from view in the dark corners of your attic and crawl spaces. They are always hungry and eat wiring, ducting, woodwork, and insulation. They defecate in these neglected areas and the smell becomes intolerable. Harmful Insects such as yellow ants, termites, wasps, ants, and cockroaches, breed by hundreds and they infest your attic and crawl spaces giving creeps to the onlooker. The lurking dust mites, microorganisms, insects, small animals, and pests dig their teeth into the wires and ducts causing damage. Their sharp teeth cause duct leakage and this leads to an imbalance in the insulation levels of the home. Dangerous gas like radon can be found in the crawl spaces and this needs to be removed because of its carcinogenic properties. Humidity encourages the growth of mold and mildew which can cause hazardous infections and destroy the foundation of the house. The harmful living organisms which are living a life of luxury in your attic and crawl spaces unknown to you need to be removed from the homes. They contaminate the area and are the main cause of numerous protozoan infections, but they can hide in unimaginable areas and are very difficult to find. Quartz Solutions promises “home wellness” to you. We use the latest paraphernalia to rummage around and search for these harmful microorganisms, pests, insects and small animals. The first step is the planned inspection organized by us and that too free of cost. You will get experienced teams searching out each corner of your attic and crawl spaces and that too free of charge. Contact us at Quartz Solutions now, and take the first step to cleanliness. Who doesn’t desire a fair deal with money? Quartz Solutions understands this totally and offers the most competitive rates for cleaning, improvement, maintenance and upkeep of your attic and crawl spaces. North Haledon in New Jersey is a peaceful and quiet area that is home to 7920 people. The community is basically family centric. The region is beautiful with museums, parks, historical sites, wineries with a fair share exciting events. We at Quartz Solutions love North Haledon and promise to keep all the homes and business places of the city clean, healthy and comfortable. Call today: 973-536-1013 for a free inspection of the attic and crawl spaces and a schedule a customized cleaning plan to maintain hygiene levels in your home. 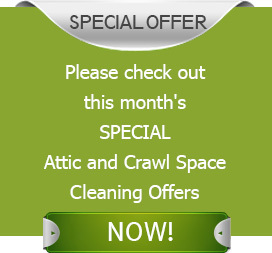 I needed an attic cleaning service urgently. Quartz Solutions were life savers! Josh was really awesome! He and his team removed and changed the old insulation and ducting, rat proofed the attic and blocked every opening. Prompt and effective services and great follow-up too! Really appreciate their precise work and attention to details. Thumbs up for a phenomenal job!! !